Here are some tips so you know what to expect on the exam day. These tips are for the paper based exam (not the Speaking test or Cambridge English: Young Learners exams). 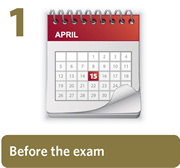 Check the date, time and address of your exam. Your centre will send you this information. If you have any questions, contact your centre before the exam day. Remember to check how long it will take you to travel to the exam, especially if your exam is at a weekend or on a holiday. Get to the exam early! Follow the direction signs to find the exam room or go to the reception of the building and ask for directions. Your centre should send you a summary of the exam regulations, make sure you are familiar with them. Bring your identification, for example a passport. It must be an original (not a copy) and must have a photo of you. Bring pens and pencils. Your centre will also give you pens and pencils if you need them. Do not bring food or drink to your desk in the exam room (except a bottle of water). 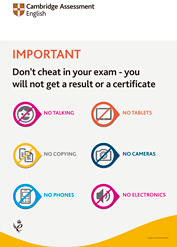 You cannot bring your phone or any other electronic devices to your desk in the exam. Your centre will tell you where to put them during the exam. Do not bring bags, phones, etc. to your desk. Listen carefully to the instructions which the invigilator will read out. Do not talk to other people, or try to see what they are writing. Make sure you follow the exam instructions. If you have any questions, need help or want to leave the room, raise your hand to ask for help. There will be a clock in the exam room to help you with your timing. If you are doing a Listening test, check that you can hear the test properly. Raise your hand immediately if you cannot hear the recording. At the end of each paper (e.g. the Writing paper, the Reading paper, etc. ), the invigilator will tell you to stop writing. You must stop immediately. Give all papers to the invigilator, including question papers, answer sheets, rough paper, etc. Always stay in your seat until the invigilator gives you permission to leave the room. If you have any questions or problems, tell the invigilator immediately. If you have registered for our Online Results Service we will email you as soon as your results are released. Using the profile you created, log in to the Online Results Service and check your results. you will not get a result or a certificate. Please view this poster and make sure that you understand what it says. Here are some tips so you know what to expect on the exam day. These tips are for the parts of the exam that you do on a computer (not the Speaking test). Listen carefully to the instructions which the invigilator will read out. Make sure you follow the exam instructions on your computer screen. There is a timer on the screen which will tell you how much time you have to complete that section of the exam. Do not talk to other people, or try to see what they are typing. If you have any questions, need help or want to leave the room, raise your hand to ask for help. At the end of the exam, leave any paper that you have used for notes on the desk. Do not take it out of the exam room. Here are some tips so you know what to expect on the day of the your Speaking test. The centre may take your photo for identification before the exam. Turn off anything electronic (for example, your mobile phone) when you arrive at the venue. • tell you where to wait, and take you to the test room. Follow the instructions and wait quietly for your test. While waiting for your test you can practise your English by talking to the other candidates quietly in the waiting area. Your supervisor will tell you where to put your bag during the test. If you have any questions or problems, tell the supervisor immediately. You must not speak to other candidates waiting to do their test. ...and helpful things to remember during your test. If a candidate detects an error on his or her exam entry document (Confirmation of Entry - COE) this must be communicated to the Examination Centre so that it can be amended before the date of the test. Candidates requiring special needs or assistance on the day of their examination must make a written request to the Exam Centre on or before the examination entry deadline date and submit the necessary documents for approval. Candidates failing to do this may not be granted special needs. The use and possession of mobile phones and electronic items in the examination rooms and during the breaks between components. Breach of any regulation, rule or instruction that has been given verbally or in writing. All candidates are expressly required to abide by the conditions of service and the examination regulations as a prior condition to take the examination. By accepting the examination regulations and conditions of service candidates agree to behave adequately at all times during the examination session and to abide by the examination regulations set out by Cambridge English Language Assessment. The rules and regulations on how candidates must behave during the examination are given in the Notice to Candidates. Centres will give a copy to each candidate. Anyone not following the instructions contained in this Notice may be stopped from taking the examination or may be subject to the Malpractice procedures, full details of which are available on www.cambridgeenglish.org/help/malpractice. Malpractice such as copying is likely to be noticed by the invigilator or supervisor, but may also be detected by examiners during marking and by statistical checks applied to candidates’ answers. Any candidate found to have been involved in malpractice will not receive a result. Candidates have the right to appeal, via their Centre Exams Manager, against any decision relating to malpractice, and details of the Cambridge English Language Assessment Appeals Procedure are also available on www.cambridgeenglish.org. The use of offensive, rude or racist language in examination answers will not be accepted and an examination will not be marked or a result given if the examiner finds language like this. Cambridge English Language Assessment’s decision on this is final. Cambridge English examinations are marked by qualified examiners who are subject to a rigorous training and monitoring programme. Part of the monitoring of Speaking Examiners may involve the audio-recording of selected live interviews. Candidates should, therefore, be aware that their Speaking test may be recorded. Any behaviour considered by the Cambridge English Language Assessment regulations to be fraudulent will result in the withdrawal of candidate results.